Plot From IMDB: Reg (Damon Herriman) and Lindsay Morgan (Angus Sampson) run an organic fertilizer business. They need a fresh supply of their “secret ingredient” [a.k.a. human bodies] to process through the meat grinder. Reg comes across two guys (Oliver Ackland & Jamie Kristian) and a girl (Anna McGahan) with a broken-down vehicle on their way to a music festival. Review: As part of my horror movie catch-up, I decided to check out this horror-comedy from our friends Down Under in Australia. 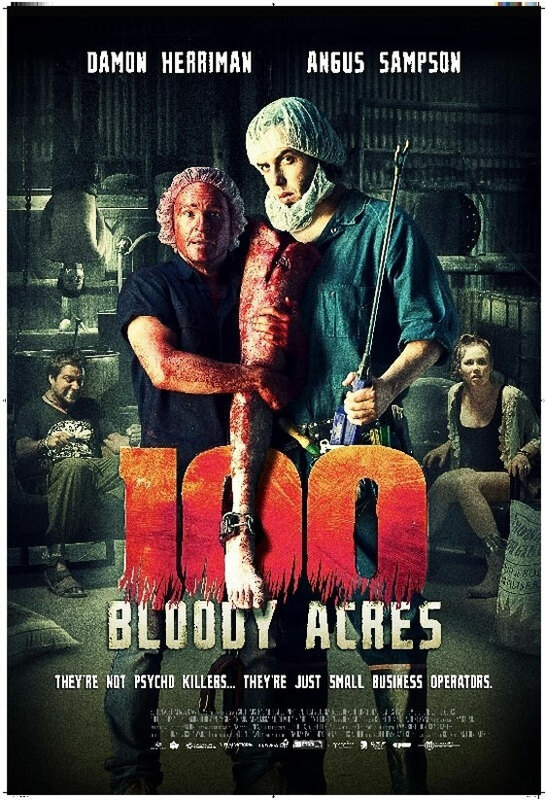 I thought 100 BLOODY ACRES would be a dumb independent horror-comedy that wouldn’t do much for me, but I was pleasantly surprised how much I really enjoyed this charming little flick. It’s not easy balancing horror with comedy, but 100 BLOODY ACRES succeeds with it. The premise is your typical “backwoods family kidnaps tourists to murder/feast upon them” kind of horror film. But underneath the surface, it’s really a goofy comedy about how love can overcome evil. All the characters are a bit over-the-top in all the right ways, infusing the movie with personality and charm that makes the 90 minutes go right by. Reg is the simple brother, being subservient to his older brother Lindsay out of fear, with his crush on one of his victims being the catalyst to change his ways and outlook on life. Lindsay is the more business minded brother, not caring who dies if it’ll help his business. Even the victims - gullible James, his girlfriend Sophie, and best friend Wes - all start out one way, but end up becoming totally different characters by the end of the film due to well-written character arcs. There are great lines of dialogue and the character interactions are very amusing and surprising at times. 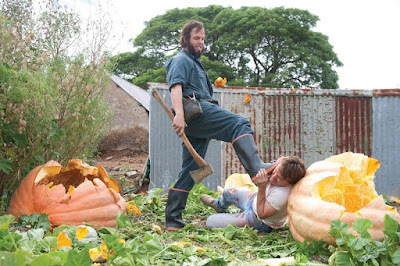 For a film that’s modeled from THE TEXAS CHAINSAW MASSACRE and MOTEL HELL, it stands out on its own two feet as it’s own memorable Australian thing. The direction by Cameron and Colin Cairnes is pretty darn great, as the tone never changes and tells a unique story in a pretty quick running time to never wear out its welcome. There are cool shots that sprinkle throughout the film, and the cinematography is very nice too. I love looking at the Australian locale - looks like a beautiful place. I would definitely check out more work from these brothers. The acting is what makes 100 BLOODY ACRES really work. Damon Herriman is funny as the quirky, naive and innocent Reg. He makes a villain really likable and sympathetic. Angus Sampson is great as the opposite Lindsay - playing menace and cruelty for laughs. Herriman and Sampson have a great brotherly relationship with each other that elevates the script. Anna McGahan is cute as Sophie, using her sexuality to seduce multiple men in the film. She starts out as someone you wouldn’t particularly like, but ends up being an interesting character by the end. Oliver Ackland is also good as the clueless boyfriend, while Jamie Kristian has the more funnier moments under the influence of drugs. Chrissie Page as Nancy is also a delight as the quirky elderly neighbor. I really enjoyed the actors here. The Final Howl: 100 BLOODY ACRES is one of the better horror-comedies I’ve seen in modern horror. Great acting, genuine laughs, solid direction, and just a fun story that takes elements from other horror films to create its own thing. If you’re looking for some good horror from Down Under, 100 BLOODY ACRES is for you.